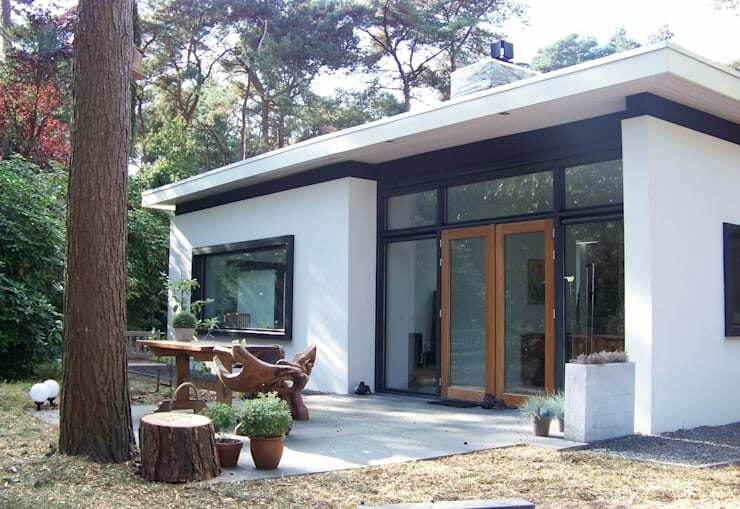 Today, we are going to visit Amersfoort in the Netherlands where design professionals Bureau MT transformed a dated home in the woods into gorgeous, eco-friendly home. Built in the 1970s, the house was updated with an open plan design which allows the different rooms to run smoothly into one another, creating a far more interactive and social space. Despite its location in the woods, there is plenty of sunlight flowing through the glass windows and skylights. 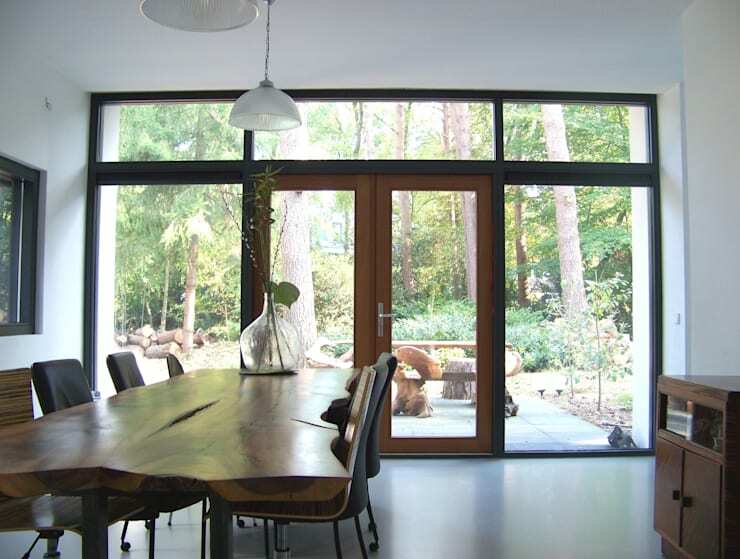 The large windows are designed to work like picture frames, framing the natural environment. The effect of the facade broadly reflects the original architecture, but is now far more detailed, modern and sustainable. The walls and the roof are equipped with high quality insulation and three-fold glazing. The house is also equipped with a solar water heater. From the outside of the home, we can see that the owners chose a predominantly white home with black finishes, interspersed with sleek glass windows and doors and a touch of wood. These neutral colours and materials create a very sleek and sophisticated look and feel. They chic house contrasts beautifully with the natural surrounds of the home. We can see how the home is a modern addition to the raw woods, lush trees and abundance of flowers. We can see how the home spills out onto a concrete terrace, which features rustic patio furniture. This integrates the more natural and rural with the very stylish architecture. We can see that the same neutral colours are maintained throughout the interior. 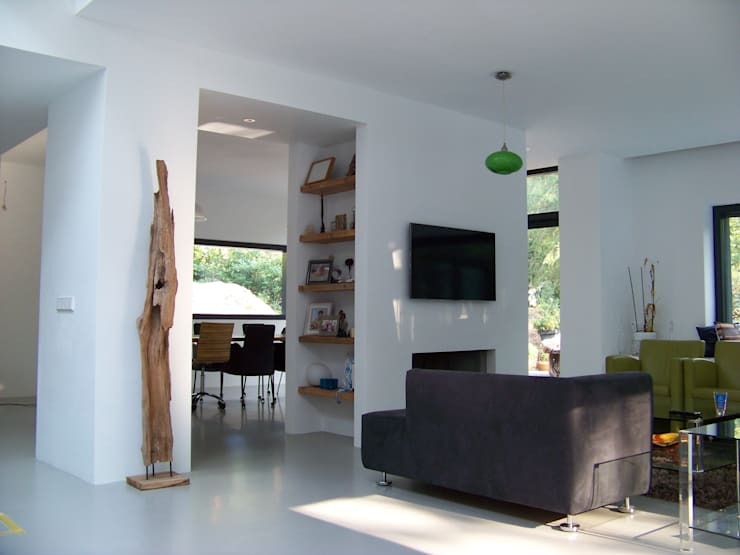 The walls are white, complementing the grey screed flooring. 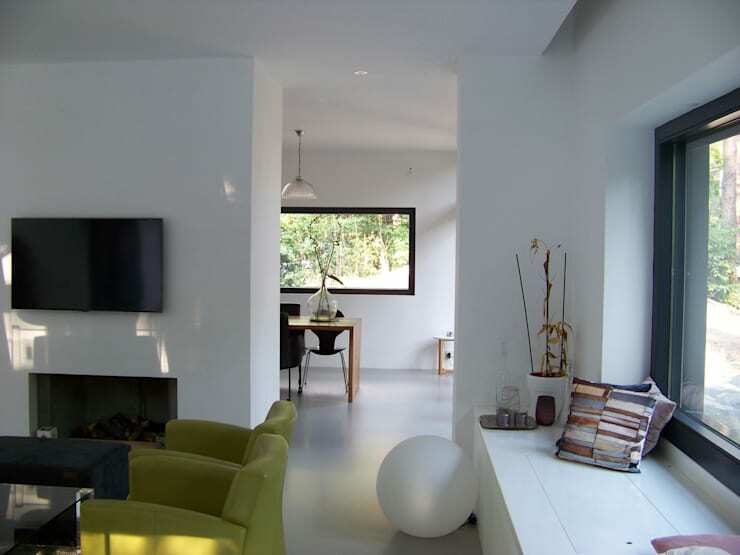 In this image, we can see how the living room flows into the dining room, creating a gorgeous open plan design. The natural light is also apparent, with the large glass windows and doors allowing sunshine to stream in throughout the interior. The designers chose grey sofas and wooden decor elements, including a sculpture in the corner of the room and light wooden shelving on the walls. In the living room, we can see how the designers have added a touch of green to the space, bringing personality, charm and color to the home. Working from a neutral base and adding some colour here and there can truly transform a home. If we move from the living room into the dining room, our eyes immediately come to rest on the dining room table. It is truly the focal point of the home. The dining room table is a slice of tree trunk, bringing that rustic, warm and earthy look and feel into the room. This is further enhanced by a subtle vase of flowers on the table. The dining room spills out onto the terrace that we looked at earlier, giving the family the option of opening this space up to create a much larger dining or entertainment area. The lamps that hang over the table are not only trendy and stylish but they are also functional. They provide ambiance and atmosphere to the area, which sets the perfect tone for a wonderful dinner party! Have a look at your guide to a cozy dining room in a small house. In this corner, behind the living room, we come across a white bench that fits into the window. This is the perfect area for relaxing with a good book or having an afternoon nap in the sun. This bench also visually extends the living area, making it that much bigger, more functional and expansive. Don't you love how the designers have added a detailed pattered cushion to the space, giving it a pop of colour? This is a wonderful example of how you can use those wasted nooks or corners in the house. Have a look at these other tips for getting creative with those wasted corners. If we look at the living room from this angle, we can see how it also opens up on the kitchen. The hallway in between, however, is just as stylish, functional and fabulous as the rest of the home. 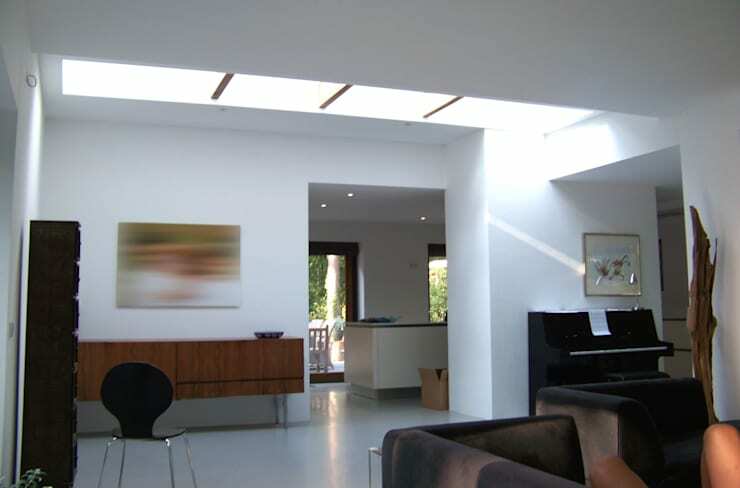 For starters, a long skylight runs along the entire length of the ceiling, offering the home an abundance of natural light. On the left, we come across a wooden cabinet and a piece of artwork. The cabinet allows items to be stored neatly out of sight, creating a chic and minimalist interior. This is a modern home that defies what a house in the woods should look like. It is stylish and sophisticated, contrasting with the ruggedness of nature. What do you think of this home in the woods?